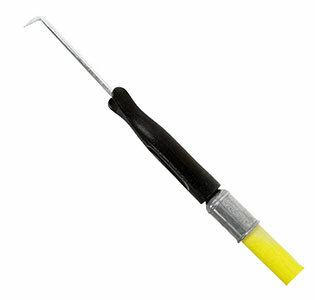 PRODUCT: 9" 2-IN ONE SEAM WELD PROBE. STEEL CONSTRUCTION WITH PLASTIC THREADED HANDLE. PRICE / EACH. DESCRIPTION: Handy probe for testing welded roof material seam and other plastics welding seams. Attaches to extension handle (not included) for stand-up use. STEEL CONTRUCTION WITH PLASTIC HANDLE. INSIDE THREADED HANDLE FOR USE WITH POLES. USE: Probe has a handle which is tapped to fit standard threaded extension handles allowing the tool to be used from the standing position.